The Membership Director will respond to your inquiry at his/her earliest convenience. Thank you! Swimming and diving instruction are provided by HFSC as some of the many programs offered to its members. A child may register for only one swim class per session (exclusive of diving, competitive swimming, synchronized swimming and Youth Water Polo). Prerequisites for Class Participation: Please see class descriptions below. We will administer PRE-SWIM TESTS for enrollment in any class if necessary. Individual testing and screening will be set up by appointment for swimmers who do not know which swim class to take. Contact Janna or one of the aquatic staff prior to swim class registration for more information. Morning Swim and Dive classes will run for three weeks Monday-Friday. There are three morning lesson sessions. Evening Swim classes meet for four weeks on Tuesday/Wednesday/Thurday evenings. There are two evening lesson sessions. 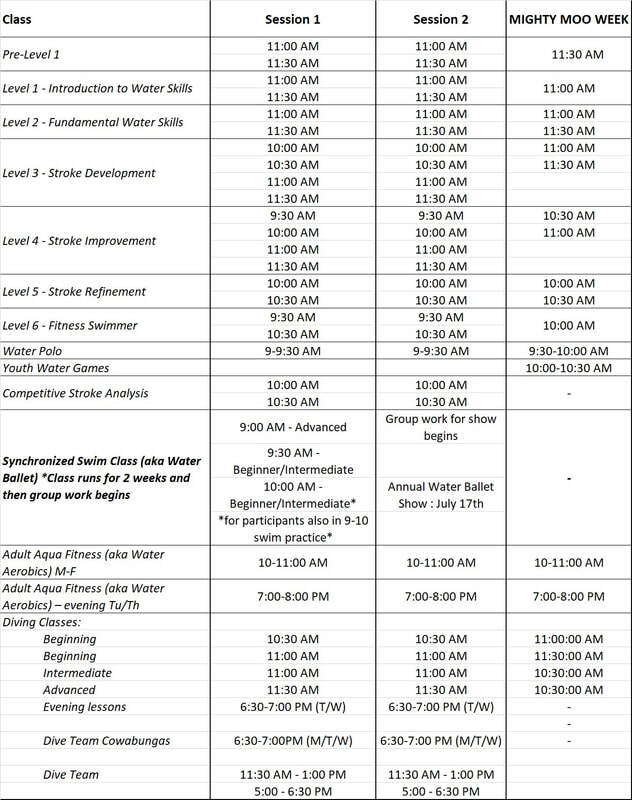 Swimmers may not take morning and afternoon lessons at the same time. Two sessions of four week classes will be held M-F and one “Mighty Moo Week” August 6-10. See page 20 for class times. Swimmers may not take morning & evening lessons concurrently. Take your place on the wall at HFSC! ​​We are adding to our wall of​ Legend-DAIRY members! Don't miss out on this opportunity to ​seal your place as a member of our amazing FARM-ily forever by adding a tile to our wall of fame. Orders due by Sept. 30, 2018, so don't delay! Sassy Cow Creamery is coming to Hill Farm! They will be bring a baby calf and lots of delicious ice cream for everyone to enjoy! Yes, you read that right - we will have a baby calf visiting us on the Hill Farm lawn. You won't want to miss this event! Suggested donation of $1 per person to help offset the cost.